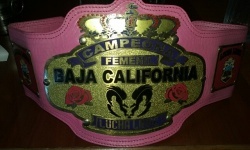 The Baja California Women's Championship is an state title which is defended in Baja California. Princesa Hernández is the fourth and current Champion. Winning a triangle match against Princesa Tirana & Aira in order to have a new champion. This match was on April 1, 2018 in Arena Nacionalista. All Women wrestlers from Baja California were invited to participate for the first state women's title. Two luchadoras from Mexicali responded to the invitation they were Baronessa and Miss Tiger. On February 14, 2016 there was a decision match to determine the inaugural champion. Baronessa defeated Miss Tiger at Arena Nacionalista to become the first women's champion. Amazona became the second Champion on January 29, 2017 at Arena Nacionalista in a ladder match against Baronessa, Miss Tiger & Lady Lee. The International Women's Championship and the AKE Women's Championship were also on the line. Amazona was unable to defend the title due to an knee injury and she had to left the title. Berber Promotions brought a wrestling event which include a surprise Championship match for the vacant Baja California Women's Championship. There was a singles match between Miss Tiger vs Navitt. Miss Tiger became the new champion. Miss Tiger was unable to defend the title due to an injury on March 25, 2018. There was a triangle match on the following week to crown a new champion on April 1, 2018 at Arena Nacionalista which included Princesa Hernández, Aira, Princesa Tirana, the winner of the watch was Princesa Hernández becoming the 4th Champion. Championship vacated on March 25, 2018 when Miss Tiger did not appear for title defense due to an injury. triangle match to crown new. champion. ↑ Baronessa and the Reyes del Aire Champion Skalibur teamed up to defend their respective titles against Lady Lee and Galactico in a mixed tag team match. ↑ Mask & Championship vs Mask & Championship. Baronessa retained her Championship, won Lula's mask, and became the new International Women's Champion. ↑ Ladder Match the International Women's Championship and the AKE Women's Championship were wagered as well. If a participant was eliminated by submission or pinfall she losses the right to compete. In order to win the championship the participant should clim the ladder and get the title. 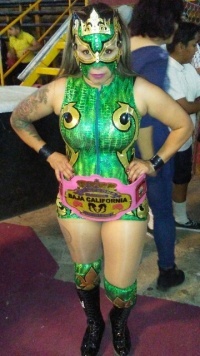 ↑ Miss Tiger was scheduled to defend her three titles, the Baja California Women's Championship, the Arena Nacionalista Reyna de Reynas Championship and the International Women's Championship against Aira & Princesa Tirana and she could not compete due to an injury therefore, all titles were vacated. ↑ Princesa Hernández and the International Women's Champion Aira teamed up to defend their respective titles against Amazona and Datura in a tag team match.